We present the first results from the MALT-45 (Millimetre Astronomer's Legacy Team-45 GHz) Galactic Plane survey. 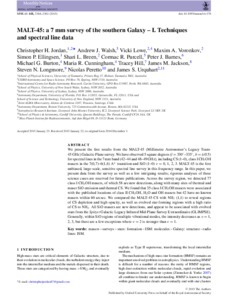 We have observed 5 square degrees (l=330°–335°, b=±0°.5) for spectral lines in the 7 mm band (42–44 and 48–49 GHz), including CS (1–0), class I CH3OH masers in the 7(0,7)–6(1,6) A+ transition and SiO (1–0) v = 0, 1, 2, 3. MALT-45 is the first unbiased, large-scale, sensitive spectral line survey in this frequency range. In this paper, we present data from the survey as well as a few intriguing results; rigorous analyses of these science cases are reserved for future publications. Across the survey region, we detected 77 class I CH3OH masers, of which 58 are new detections, along with many sites of thermal and maser SiO emission and thermal CS. We found that 35 class I CH3OH masers were associated with the published locations of class II CH3OH, H2O and OH masers but 42 have no known masers within 60 arcsec. We compared the MALT-45 CS with NH3 (1,1) to reveal regions of CS depletion and high opacity, as well as evolved star-forming regions with a high ratio of CS to NH3. All SiO masers are new detections, and appear to be associated with evolved stars from the Spitzer Galactic Legacy Infrared Mid-Plane Survey Extraordinaire (GLIMPSE). Generally, within SiO regions of multiple vibrational modes, the intensity decreases as v = 1, 2, 3, but there are a few exceptions where v = 2 is stronger than v = 1.